In the "That's Gotta Hurt" Department . . . If you haven't seen this article in Publishers Weekly about AuthorHouse being ordered to pay a quarter million in damages from a defamation lawsuit, you should. 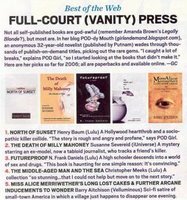 In his 14-page decision, Judge Jeff Goering asserted that AuthorHouse “acted towards the plaintiffs with wanton conduct,” in publishing Paperback Poison, despite the fact that Gary Brock, the book’s author, had informed AuthorHouse during contract negotiations that iUniverse had rejected the manuscript on the grounds of possible libelous content. I mean, if the author surrendered the knowledge that iUniverse rejected it based on the content, why are they surprised at the outcome of the trial? And perhaps more importantly, why didn't this happen to PublishAmerica instead? An unjust world, it is. And check out this publicity for 2005 POD-dy pick TORPEDO by Jeff Edwards. Here is a guy who knows how to make his book stand out. Great idea. For all you BKSP fans (and everyone else), you should take note of a publishing pro in need. E.J. Knapp, who is affiliated with Backspace, has fallen on some hard times. I know, we're all broke and struggling and hoping they'll come out with some new flavors of ramen noodles--but E.J. is really broke and struggling. Take a look at the list. It's impressive--and growing. It's a great way to help and to enjoy some great writing. Please check it out. Entertainment Weekly beats the Golden Needle? In less than one week, three of the five authors of the POD-dy Picks profiled in the Entertainment Weekly piece have been offered representation--by excellent agents, too. Holy cow. And one of the five has been tapped for the movie rights for his book. Holy cow again. I had no idea so many folks in the publishing industry read Entertainment Weekly. That's major! Remember Ian Hocking, author of last year's POD-dy Pick for Deja Vu? He has a dynamite interview with Scott Pack, former Buying Manager for Waterstone's. And Scott has some interesting observations on POD. 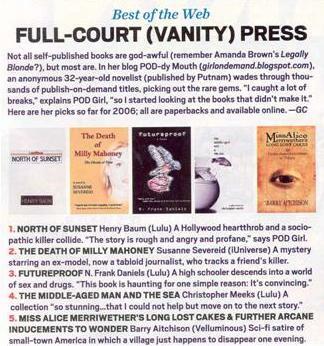 Check it out.
. . . the pages of Entertainment Weekly, that is. Yeah, the wonderful folks over at EW did a little box/piece on me--or rather, the books I review and the purpose of my blog. As a result, my five picks for 2006 (the selections so far) ended up getting more publicity than most commercially published novels ever get (my own included) and have seen a surge on Amazon and the like. At one point, the recently reviewed book MISS ALICE MERRIWETHER'S LONG LOST CAKES & FURTHER ARCANE INDUCEMENTS TO WONDER was ranked at 507--not to mention the author was contacted about having the film rights acquired! And three agents were in contact with me about getting in touch with the authors of two of the other books. You can catch a little snippet here, but you really need to see the print edition to get the full impact (the covers of the books.) It's the issue with LITTLE MISS SUNSHINE on the cover. Thanks, too, to the folks over at Readerville for spreaing the word.